The Cloud Gate sculpture in Chicago’s Millennium Park by Indian-born British artist Sir Anish Kapoor is lovingly referred to as ‘The Bean’. It is 66 feet long, 33 feet high, 42 feet wide and weighs in at 110 tons (yes – 220,000 lbs!). The 168 stainless steel plates that form the exoskeleton were welded together and polished to a seamless mirror-finish. 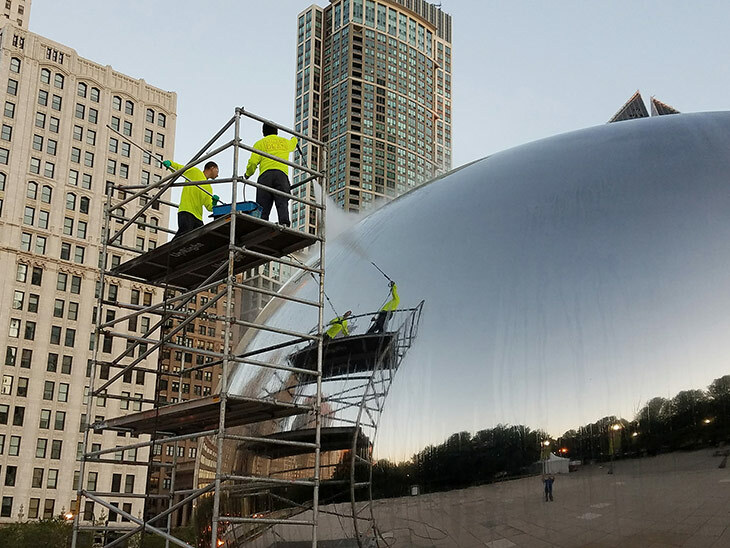 Anyone who’s worked to keep stainless steel appliances fingerprint-free can appreciate the monumental task of maintaining the metallic luster of Cloud Gate. Add in a flock of pigeons and – you get the idea! Maintenance crews wipe down the bottom six-feet of the three-story sculpture several times a day with soft polishing cloths, but what about the rest of it? How does the ‘Bean’ keep that high shine all year long? Stuart Dean crews, working in off-hours, erect scaffolding and use a mild detergent and a low-pressure sprayer to remove dirt and bird droppings. Then the crew hand-polishes the steel with an environmentally friendly solution to achieve that mirrored look. Another of Kapoor’s sculpture’s, Cloud Column, has recently been installed in the Brown Foundation Plaza outside of the newly opened Glassell School of Art in Houston. The vertical piece, 30 feet tall and reported as weighing in at 10.5 tons (21,000 lbs) may not be in the same weight class as its Chicago rival but in the hearts of Houstonians, it’s a heavyweight! Houston, if you have a problem, give Stuart Dean a call. We have experience with large, mirror-finished, stainless-steel pieces of art that look like they could be from outer space! Dear Chicago: Houston’s bean is better. And so is Houston.